I guess just about everyone loves chili and fries. 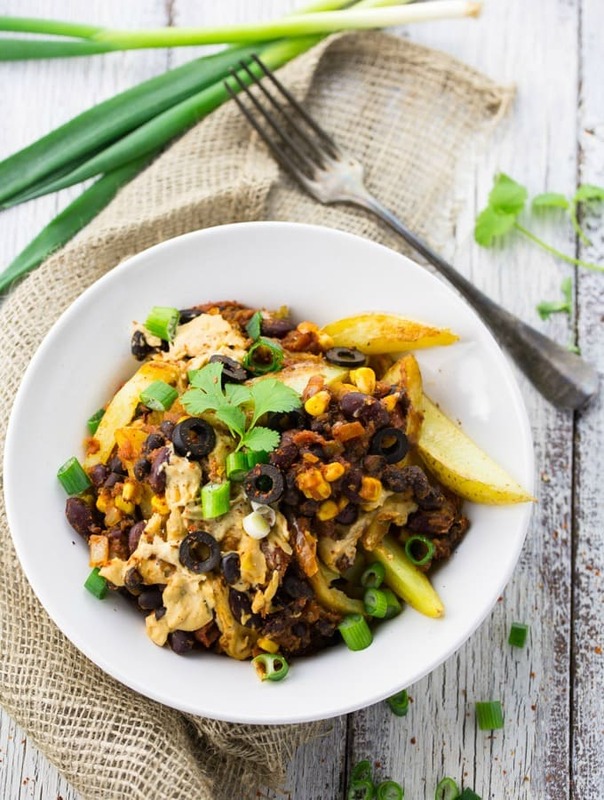 So these vegan chili cheese fries are the perfect treat when you’re craving comfort food. They’re not oily and greasy like the classic junk food and so much healthier! 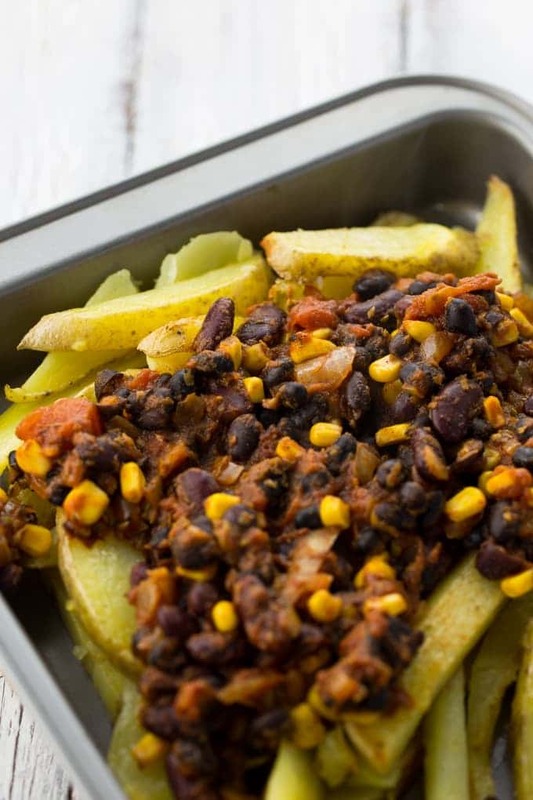 You can actually feel pretty good after eating these veggie chili cheese fries. They’re packed with flavor minus all the fat from the cheese sauce. 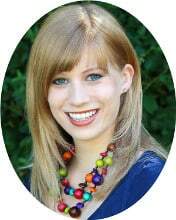 Like all recipes on my blog, they’re of course completely plant-based. Plus they’re super comforting and almost oil-free! For me it’s also the ultimate sharing snack, which makes it perfect for any birthday party that’s coming up! A couple of weeks ago I realized that the last time I had vegan chili cheese fries was more than one year ago. Can you believe it?! So it really was about time to make a large bowl of this delicious comfort food and share it with you guys on the blog. You might wonder why I know the exact date of my last chili cheese fries encounter. Haha! No, I don’t keep a diary with all the food I eat. I still remember it because I had it on a vacation to New Orleans. Like all tourists do, we went to French Market and I was so surprised to find a little stall selling vegan muffins and vegan chili cheese fries. So of course I had to give it a try and it was soooo good! Unfortunately I can’t remember the name, but keep your eyes open. 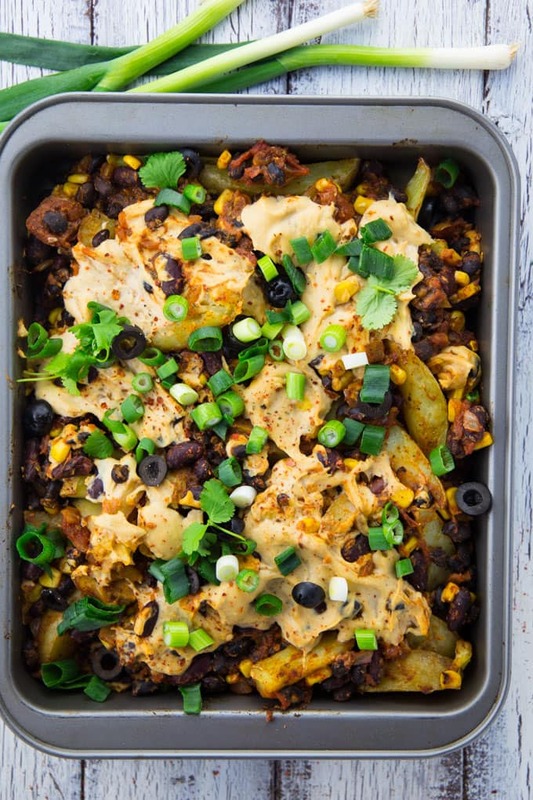 The best thing about these veggie chili cheese fries is definitely the vegan chili cheese sauce. I love using cashews, nutritional yeast, and white miso paste for my vegan cheese sauces. The nutritional yeast and the miso paste gives it such a cheesy flavor and it turns out super creamy. This time I also added cooked white beans and they were a great addition! I strongly recommend making your own fries for these vegan chili cheese fries. Homemade fries are just so much better than frozen ones! Just cut some russet potatoes into french fries and bake them for about 30 minutes until they’re crispy. You can of course also use frozen french fries when you’re short on time. But trust me you really won’t regret taking the time to make your own. 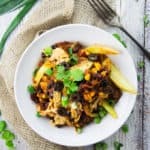 Let me know if you give these vegan chili cheese fries a try! These vegan chili cheese fries are the perfect guilt-free treat when you're craving comfort food. They're packed with flavor and are super delicious! Preheat your oven to 350 °F. Cut the potatoes into french fries and bake them for about 30 minutes until they're crispy. In the meantime, make the chili. Heat some oil in a large pan and sauté the onion for about 2 minutes. Then add the garlic and cook it for one more minute. Add the the tomato paste, the chili and paprika powder, and cook for 2 minutes. Now add the liquid smoke (if using), the cumin, the diced tomatoes, the oregano, the kidney beans, the black beans, and the corn. Simmer for 10 minutes. Make the vegan cheese sauce: Combine all ingredients in a high speed blender and blend until smooth and creamy. Once the fries are ready, add the chili and the cheese on top and bake for another 10 minutes. Serve with green onions, fresh cilantro, and black onions. Yum! This recipe is comfort food at its finest. Oh YUM! I love chili cheese fries and haven’t had them in what feels like forever. 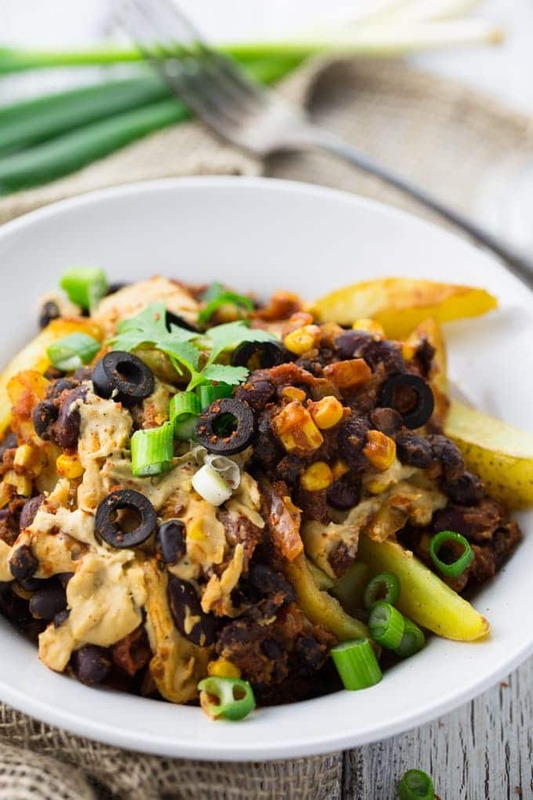 I’ve actually never had vegan chili cheese fries, but they look absolutely delicious! All of my favorite things all piled up on one plate. Nothing but love for this dish! Oh my, one of my favorite comfort foods, been addicted ever since my last pregnancy! A year ago? I honestly don’t remember if I’ve ever had vegan chili cheese fries! Time to remedy that. These look AMAZING. Love chili cheese fries! I have a recipe that I make monthly! These look soo good I’m now craving them! I only found red miso paste at the store– is it possible to use this instead of the white? This was soooo delicious!!! Made it yesterday for my boyfriend and me and we both loved it. Thanks for the recipe, Sina!